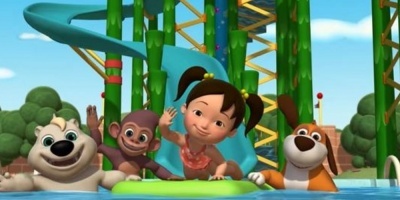 This is the second post from our Learn Chinese for Kids Series. 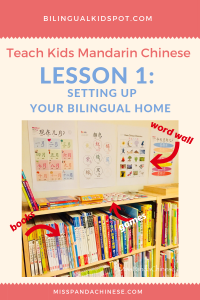 Here you can find an introduction on how to set up your bilingual home and help you to teach kids Chinese. Being bilingual has many benefits for children, according to more and more studies in recent years. Raising bilingual kids is an exciting journey for parents and educators. 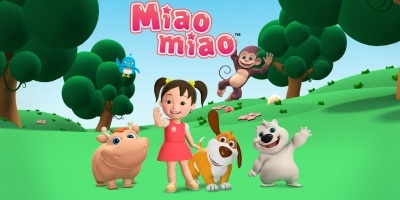 Teaching children Mandarin Chinese opens up doors and windows for kids to connect with a splendid world culture and to experience one of the most widely spoken languages in the world. Welcome! Nǐ Hǎo 你好! I am Amanda. My students call me “Miss Panda.” I am thrilled to see you here! In this “Teaching Kids Chinese” introduction series, I want to provide you tools to start your family’s multilingual journey with Chinese (Mandarin). Educators who teach at early childhood education programs and elementary schools can utilize the resources here in their classrooms. 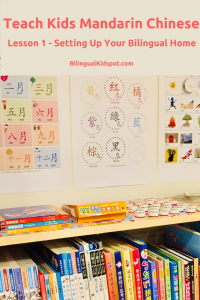 In this article, I want to show you tips to set up your own multilingual teaching area and to implement a growth mindset for raising bilingual children. Last but not least, you will have the class notes for your first Chinese session. Fireworks and firecrackers, please! Let the party begin! Think about the time when you were decorating your baby’s room. You wanted to create a happy and playful place for your child. That is exactly what your bilingual home will be like – a happy, playful and inviting place for teaching the target language, Chinese. Children are observant, and they get excited by the new things added to their environment. Learning is multi-sensory, so you will incorporate all five senses to enhance the language experience. 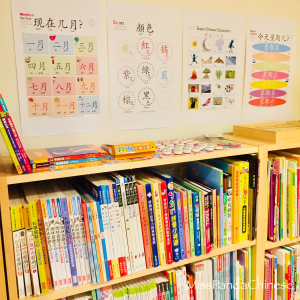 Many of the tools I talk about below are already in your home, and will help you to teach your kids Chinese. Sight is a pivotal sense and important if you want to teach children Chinese. When kids walk into a room they see color, they see pictures, they see all of the things around them. What you have at home can inspire their curiosity. Help your kids learn Chinese with these resources you can download and print at the end of the article. Chinese Books: Start a Chinese book basket. Add Chinese children’s books, Chinese-English bilingual books, or Chinese books with pinyin to start with. Go to your neighborhood library and see if there are any Chinese children’s books available. A globe or a map: Learning a language connects your child with world culture, history, and geography. Have a globe or a map handy so you and your children can travel from where you are to the many Chinese-speaking cities and countries with the globe and the map. Sound is an empowering sense. Listening is an important skill. Your voice is soothing for your baby. Listening to a favorite lullaby, a nursery rhyme, or a story in Chinese is calming and relaxing for your child. 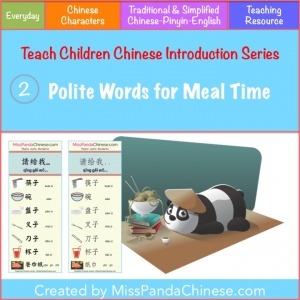 Help to teach kids Chinese with these tips. 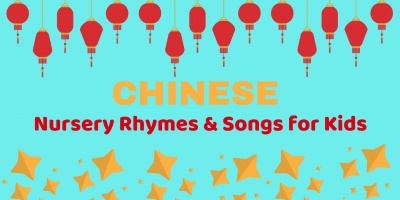 Chinese background music and nursery rhymes: Songs, nursery rhymes, and short, easy stories are great ways to step into learning Chinese for young children. Chinese language input: Do you remember that you might have read the Good Night Moon story book more than 286 times before your kids spoke their first words? My husband and I do. (…and my son chewed up a corner of that book at the same time. I am not exaggerating!) That is exactly the same process that children will need to go through when learning a new language (perhaps minus the book chewing!) You will need to do a lot of talking, with a lot of repetition, and use lot of activities with a pool of similar expressions. You’ll also need a playful spirit. That is also part of the language input. The more you speak the more your children will hear it. When they are ready they will start talking too. Smell is a sense that helps kids to understand their world, and it also helps learning. Chinese cooking ingredients: soy sauce, sesame oil, black sesame seeds, white sesame seeds, cinnamon powder, Chinese rock sugar, and cooked/uncooked rice. For older kids you can try anise, five-spice powder, garlic, fresh ginger, or green onion. This is a pleasant and fun experience, so pick the items that you think will work best with your children. Mystery Cup activity: Pick 3 to 5 items from above and add each to a paper cup. Cover the top with paper. Poke a few holes on the paper and let the kids do a smell test. Does it smell good? Does it smell like a flower? Tell them Chinese people cook with these ingredients. Ask your children if they have tried any Chinese dishes. Ask them to guess what Chinese ingredients the chef used in the dish they have tried. Make it a cultural experience. Taste is an important sense because it tells the kids the flavors of food. It is interesting to see how children explore new food. Chinese fruit: Pomelo, tangerine, gurava, dragon fruit, star fruit, Chinese pear, lychee, kumquat, and wax apple. Use a mix of fruit that you already have with a few of the Chinese fruits above depending on how easy it is for you to locate them in your neighborhood grocery store. Guess The Taste Activity: Prepare one slice of each fruit and place the slices on the plates. Ask your kids: Do you think it is salty, sweet, bitter, or sour? Talk about the taste difference between fruit. For example: Orange vs. tangerine. Chinese pear vs. D’Anjou pear. Variation 1: For older kids you can use dumplings, fried rice, tofu, Chinese cookies, or Chinese candy for the taste activity. Variation 2: For older kids you can have a Chinese cooking session and create a multisensory experience. Touch plays an important role in children’s development and learning. Kids learn by touching and feeling various objects. You can use sensory activities to teach kids Chinese and help them to learn more about the Chinese language. Asian Sensory bin: Fill a storage container with rice, Adzuki beans (red), Mung beans (green), or soybeans. Add round home labels from the printable download to the bin. Cover the home labels with rice or any grains you are using. Ask your child to find the labels and match each with the home label sheet. If you have small dollhouse furniture add them to the bin with home labels! It will be a lot of fun for your child. Talk about how many Chinese people eat rice, drink soy milk, and have mung bean soup or Adzuki bean soup for dessert. 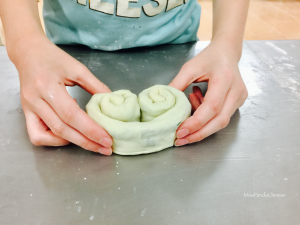 Drawing Chinese Activity: For older kids, fill a baking sheet pan with craft sand or shaving cream. Use the home labels as a guide and let them “draw” the Chinese characters of their choice on the page. Don’t worry about there being a “correct” way of writing it. At this point it is all about exposure and experience. Now, let’s talk about pandas! What do pandas look like? What do panda sound like? What do pandas smell like? What do pandas like to eat? What do pandas feel like it you touch it? What country are pandas from? Watch the video below and talk about the little panda. All of the above preparation is to inspire your child’s curiosity the Chinese language and its culture. Be a growth mindset role model on this Chinese language learning journey. Give kids compliments for trying again and again, working hard, being persistent, keeping focused, etc. 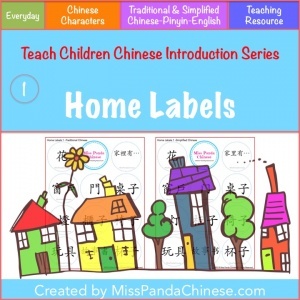 Teach Kids Mandarin: Home Labels, Polite Words –download here. Teach Kids Mandarin at Home Starter Kit –download here. “Let’s Learn Mandarin Chinese with Miss Panda” audio program –preview here. 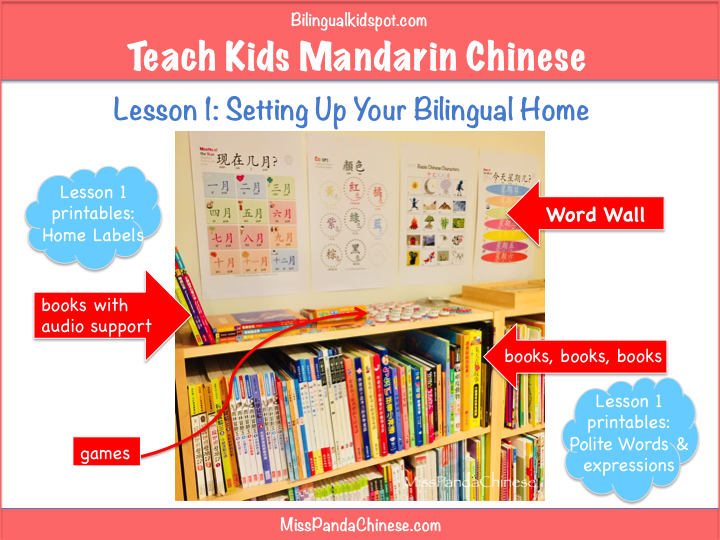 Have fun setting up your bilingual home and teaching your kids Chinese! I am looking forward to seeing you next time – With a panda hug, Amanda Miss Panda. This article is part of our Teach Kids Chinese Series, you can find other mini lessons here : Learn Chinese for Kids.